So we find many post to host forum on the internet, So we got the idea to make one and provide free VPS's to others in replace of some activity on our forum. But we have come up with the unique idea we uses Points (Cash) system from which you have to apply for VPS's on the forum. Cash will be earn Via creating a good post on the forum you can also read the full guide on the forum about making cash on our forum (link you will find below in this post.). Between we are on starter stage so we are not providing many VPs's Like other forum. But if we got some good activity on our forum we will provide more free VPS's. Giveaway Rule: Cash 200$ required to Get this Vps and monthly 300$ cash required. [b]Giveaway Rule: [/b]Cash 200$ required to Get this Vps and monthly 300$ cash required. Giveaway Rule: Cash 300$ required to Get this Vps and monthly 400$ cash required. When you use the term Cash, I would suggest that you make it the same as how much you think your VPS should be worth of. For example, if your VPS should require USD $10 per month, just make it $10 in your own Cash system. For your VPSs, I just wonder why all VPSs have only 20GB disk, even for higher spec ones? Free disk space will be very limited after a Windows installation. And it doesn't look so good all VPSs have no Control Panel. Anyway, good luck for your new services. First when I read your post I though that we have to pay for hundreds of dollars just for requesting a VPS. I think that you should call it for score, points, or virtual cash, but not dollars. And I think that it would be better asking more points from requesting and less monthly points for keeping VPS. So it's like $10 for a post and $20 for a thread. Basically we need about 30 posts a month. A little too higher than average monthly posts requirement of free vps providers these days. But it's fine for most members I think. The biggest problem is lack of a vps control panel. First of all I would like to thanks everyone for the replies. As a community member of the myblogs.me forum, (1) I see everyone asking about the "cash system" so we decided to change it to "Coins or in to power system" and we are using some new system in this " When you apply for the vps and you won the vps your 200 coins or cash will be automatically deducted and you need to make another 300 coins or cash to renew your vps for another month. Those 300 coins should also be deducted on 1st of each month. (2) Some one said about the Hdd of Vps. So we will increase the HDD for Vps 3 and Vps 4. Which will be updated soon. (2017-03-20, 1:20:21 pm)dudex Wrote: So it's like $10 for a post and $20 for a thread. Basically we need about 30 posts a month. A little too higher than average monthly posts requirement of free vps providers these days. But it's fine for most members I think. The biggest problem is lack of a vps control panel. More Suggestion to improve this forum will be appreciated. The website is unbelievably slow for me. Don't know why you have getting this problem. 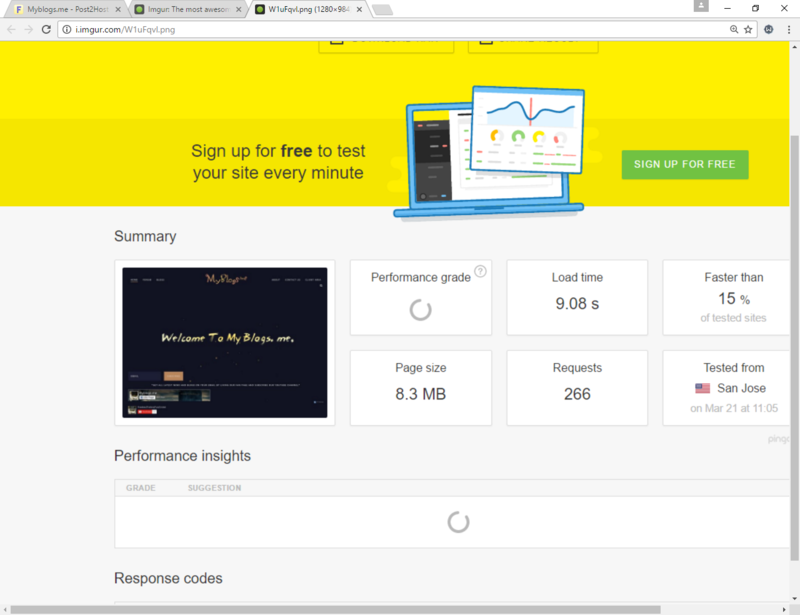 Here is the result from my side..
(2017-03-22, 1:11:49 am)doghouch Wrote: The website is unbelievably slow for me. doghouch made a test of your main site and you made a test of your forum. These are absolutely two different sites with different code and content. Your main site is nearly 9 MB in size and the forum is just about 2 MB. This huge size difference together with a slower server and the general server location is a big factor for a long loading time of your main site vs your forum. I can confirm that the main site is painfully slow. It takes quite long before it actually starts loading the content. Basically a long connection init time and then a big load due to the big size of the site. The first time I connected to it I thought it would be down but after waiting quite a long while I finally noticed that it was just really slow. Oh yeah, the size of main website is bit huge maybe that was the reason. But both the forum and website is hosting on the same host. I tested the forum only because our main concern is the forum. Any suggestion that help me to fix the main website in speed section? Current time: 2019-04-20, 9:18:39 pm Powered By MyBB, © 2002-2019 MyBB Group.